1818 E Rezanof Drive, Kodiak, AK.| MLS# 18-4961 | RE/MAX of Kodiak - Alaska Real Estate - "Honesty & Integrity...It's That Simple!" 5000 sq.ft. medical office building plus 1,904 sq.ft. daylight basement which includes studio apartment for visiting professionals. 16 exam rooms, 4 private offices, lab room, waiting room, 2 nurses stations, large administrative office area. 3 year old roof, new oil tank, recent exterior work, ample parking on site and adjacent lot. A working medical clinic for over 40 years, ready to move in. 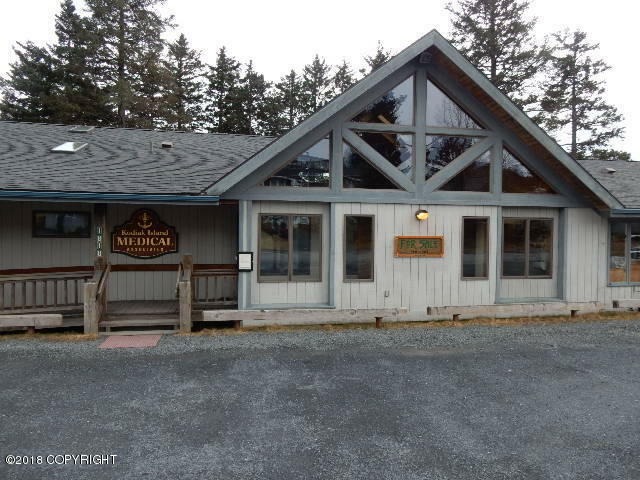 Located on a main Kodiak road just across the street from Providence Hospital. Recently professionally cleaned, carpets, windows, walls etc. Ready for you to move in. Originally built in 1975 as a family practice office. 1988 a large addition converted building to full medical clinic. Further major interior remodel in 2007. new roof in 2015.